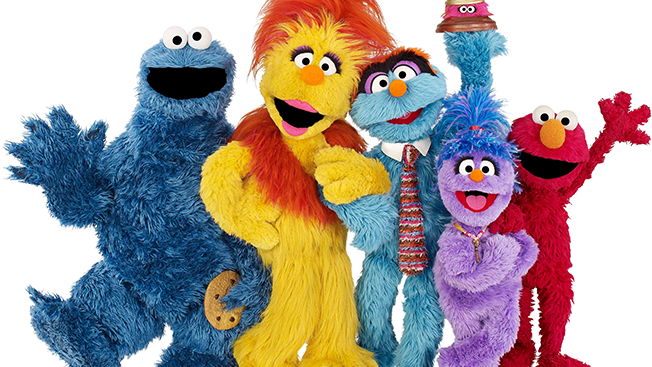 Elmo and Cookie Monster will appear in The Furchester Hotel, a new series on Sprout from Sesame Workshop and the BBC's preschool children's channel, CBeebies. The show takes place at a hotel operated by a family of monsters, including Funella Furchester, husband Furgus Fuzz and daughter Phoebe Furchester-Fuzz. Elmo, who is Phoebe's cousin, is on "an extended visit," according to a release, while Cookie Monster works at the hotel as a room-service and dining-room waiter. Both Elmo and Cookie Monster will be regular characters on the show. Beginning Sept. 26, 11-minute episodes of The Furchester Hotel will air weekdays at 9 a.m. and weekends at 11 a.m. (the weekend time slot will shift to 7 a.m. starting the week of Oct. 10). During the show's premiere week, Sprout, NBCUniversal's preschool network, will also feature Elmo and Cookie Monster on Sunny Side Up, its live morning show. The Furchester Hotel episodes will also be available via video on demand and streaming on the Spourt Now app for authenticated users. Those Season 46 episodes—which are now 30 minutes each, down from 60 minutes—debuted on HBO, HBO Latino and HBO Family in January, meaning they are available to air on PBS this fall. Five years of past Seasme Street episodes are also available to stream on HBO Now, HBO Go and HBO On Demand. Sprout launched in 2005 as PBS Kids Sprout, and was a partnership with Comcast, HIT Entertainment and Sesame Workshop. After Comcast bought NBCUniversal, it bought out the other partners and took over full ownership of the network in 2013. Sprout had aired Sesame Street episodes along with PBS, but that agreement ended last November, while spinoff Play With Me Sesame continued airing until December. This will be the first time since then that Cookie Monster and Elmo will regularly be featured on the network. The Furchester Hotel premiere is part of Sprout's "Back to New" campaign, which will feature new episode premieres from shows like Maya the Bee, Floogals and new series Terrific Trucks every day in September.